Our literacy committee blog shares information about our Rotary literacy projects and events associated with sharing access to the many different ways in which people read. Some access reading the "traditional" way, some have computers read books, Internet pages, newspapers, and other print material. Our goal is to make the "written word" accessible to every person of every age and ability. Please come back to find out about our past, present, and future projects. What is the impact of illiteracy? Illiteracy causes more harm than merely having a reduced ability to read and write. Illiteracy causes entire families to remain isolated from the everyday fabric of their local and global communities, to remain isolated from inspiration acquired by "enough education," and to remain isolated from a means to share history beyond the reaches of their spoken word. Area residents helped Rotary Club nearly double its goal for new winter coats for kids living in need. Continuing its 85 year tradition of community service, The Rotary Club of Winnetka-Northfield provided new winter coats to nearly 800 Chicago children living in need. "A winter coat is an essential item in Chicago's winters," said Rich Lalley, President of the Club. "A coat provides more than just warmth, it allows a child to attend school, where they not only receive an education, they also receive meals. A new coat provides the added benefit of increasing self esteem- who doesn't like getting new things?" New coats and dictionaries were donated to Lawrence Hall Youth Services for each of the nearly 400 children it serves. Additionally,new coats were donated to The Night Ministry and Chicago Commons, both agencies serving the neediest of Chicago's residents, including many homeless families. "Lawrence Hall helps at-risk children redefine the paths of their own future," said Mary H. Hollie, Chief Executive Officer of Lawrence Hall Youth Services. "For many of our children, Lawrence Hall is the first home they have ever known. We provide a safe environment where abused and neglected children can move on to adulthood with resiliency and hope." The Rotary Club will purchase new coats from Operation Warm, Inc.®, a non-profit charitable organization dedicated to distributing high quality, new winter coats to children living in need. Over the past eleven years, Operation Warm has distributed more than 600,000 new winter coats. Dictionaries will come from The Dictionary Project, a charitable organization that has helped distribute over 9.8 million dictionaries to children since 1995. Area citizens helped the Rotary Club with this project through donations. "A $20 contribution will warm the heart and mind of a child with a new winter coat and dictionary," said Mr. Lalley. Several fund raising activities are planned for this project. The project was funded by the club's charitable foundation, a grant from Rotary District 6440 and individual donations. The Winnetka-Northfield Rotary Charitable Foundation contributes to local, national and international charities and service projects. Local recipients include the Hadley School for the Blind, the Glencoe Educational Foundation, Child & Adolescent Bipolar Foundation, Communities in Schools Chicago, Haven Youth and Family Services, Jewish Vocational Service and Employment Center and Lawrence Hall Youth Services in Chicago. Internationally, the foundation has supported schools and libraries in Uganda, Nicaragua, Costa Rica and Viet Nam. The Rotary Club of Winnetka-Northfield meets Thursdays from 12:15 to 1:30 at the Winnetka Community House for lunch and a speaker. Membership is open to service oriented residents and workers of the area. Guests are welcome to attend. 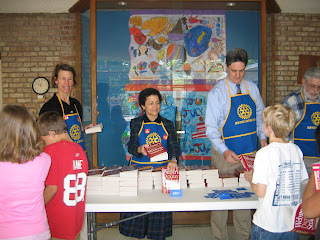 To learn more about the club and its schedule of lunch programs, visit www.wnrotary.org. Lawrence Hall Youth Services is a child welfare agency that treats, educates and provides a home for some of the most at-risk children in Illinois. Approximately 16,000 children are wards of the state of Illinois. Lawrence Hall Youth Services is a critical link in the Illinois child welfare system, providing highly specialized and individualized care for nearly 1,000 infants, children, adolescents and their families. Lawrence Hall offers a full array of services and seamless transitions from more intensive to less intensive levels of care to equip our youth with the tools and skills they need to set them on the path toward becoming proud, productive participants in society. For more information, visit www.lawrencehall.org. The Winnetka-Northfield Rotary is honored to have Premier Literacy partner with us for distributing both print dictionaries from the Dictionary Project organization (see dictionaryproject.org) and accessible electronic dictionaries from Premier Literacy, to local school children. Premier Literacy, a division of Premier Assistive Technology, recently partnered with The Rotary Club of Winnetka - Northfield in June 2009 to sponsor a charitable distribution of dictionaries to over 500 third-grade and special needs students in the Winnetka and Northfield public schools. This initiative is yet another in the continuing efforts of the Winnetka - Northfield Rotary Charitable Foundation to support charitable activities locally, nationwide and internationally. Ken Grisham, President / CEO of Premier Literacy, explains, `We were approached earlier this year by Dr. Jeanne Beckman of The Rotary Club Winnetka - Northfield to participate in their annual campaign to make dictionaries available to local students. We were pleased to be able to collaborate with Rotary to contribute to a campaign such as this that involves one of the cornerstone elements of literacy anywhere. One of our products, the Ultimate Talking Dictionary software application, is a natural fit for this initiative, particularly with the rapidly expanding presence of digital books and use of the Internet in our classrooms. We wholeheartedly endorse this effort and look forward to continued participation with Rotary in similar dictionary distribution campaigns elsewhere. Stay tuned for our Rotary club's next project where we will provide warm coats and dictionaries to Lawrence Hall. Members of the Rotary Club of Winnetka-Northfield hand out dictionaries as end-of-school year gifts to third graders at Winnetka’s Crow Island School. Rotarians from left to right, Penny Lanphier, Literacy Chairperson Dr. Jeanne Beckman, Incoming President Rich Lalley, and Joe Fell. Continuing its 85 year tradition of community service, The Rotary Club of Winnetka-Northfield this week provided a end-of-year gift to every third grade student in the Winnetka and Northfield public schools. Working with The Dictionary Project and Premier Literacy, local Rotarians acquired and distributed printed and computer software dictionaries to third graders at Winnetka’s Hubbard Woods, Greeley and Crow Island schools and Northfield’s Middlefork school. Gifts were also made to all special needs students throughout the two districts. The project was funded by the club’s charitable foundation and a grant from Rotary District 6440. The Winnetka-Northfield Rotary Charitable Foundation contributes to local, national and international charities and service projects. Local recipients include the Hadley School for the Blind, the Glencoe Educational Foundation, Child & Adolescent Bipolar Foundation, Communities in Schools Chicago, Haven Youth and Family Services, Jewish Vocational Service and Employment Center and Lawrence Hall Youth Services in Chicago. Internationally, the foundation has supported schools and libraries in Uganda, Nicaragua, Costa Rica and Viet Nam. The Ultimate Talking Dictionary (UTD), is not only a comprehensive dictionary, but has other robust, integrated features that make it unlike any other dictionary anywhere. Like all other Premier products, UTD reads everything to you. The dictionary contains over 250,000 words, terms, jargon, and even proper nouns like geographic entries (e.g. cities, countries) and historical persons. UTD has a complete thesaurus built-in that allow you to quickly find synonyms and their corresponding definitions. The “Power Search” feature lets you look up words when you only know a partial spelling. Premier’s unique Interlink technology incorporates complex cross-references between all words in the UTD so you can quickly find related terms and definitions, even when you only have a vague concept of a word. 1. How will this project meet the needs of the community? Even though many of the students in these two communities have family incomes that are far above those generally viewed as in need, most, if not all, students can benefit from additional vocabulary support and encouragement. The dictionary project has repeatedly demonstrated that students feel great pride in ownership in having their own personal dictionary. Additionally, many students have some barriers to easy acquisition to vocabulary growth, whether due to unidentified or identified learning challenges, disabilities, and/or English language learning. Combining both traditional dictionaries with software versions allows equal access and provides a foundation for lifelong learning. On January 20th, I joined many fellow Chicagoans who shivered in the falling snow while watching Obama's speech on the Jumbotron at the Daley Plaza in Chicago. While I could not hear the speech, I watched the closed-captioning (provided with Dragon voice recognition technology, I'm sure)and was struck with the hope that we can get our great country back on track. Obama's speeches are full of rich vocabulary, full of vision, and full of the love of history. Without a good education, Obama would not be where he is now, guiding us back from the precipice of illiteracy, financial ruin, and overall despair. So many times, individuals are discouraged from achieving their full potential in learning, whether due to the Pygmalion effect of low expectations for people of color or for people with disabilities. So today, I wrote a little piece to speak to the belief that any and all individuals CAN achieve their full potential. Parents everywhere, please join me in taking back the education of our children. Read to them, and if you struggle to read, seek out literacy classes and computer technology at your library to read to you and your family. There is no shame in difficulties in reading unless you refuse to ask for help in learning to read. Turn off your televisions and read, read, read. Who was it who said, those who do not know history are condemned to repeat it? Obama's speeches certainly reflect that he knows history and is using his understanding of it to bring our country back to greatness. He would not have learned history if he had not read an abundance of books on every subject he could find. Please join me in asking yourself, "What have I done today to encourage a child to reach for knowledge, understanding, and to walk the path toward community and country contributions?"